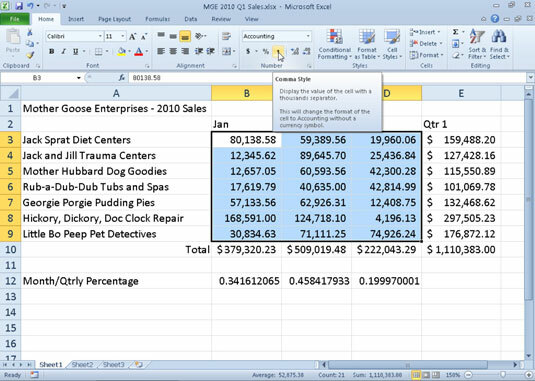 The Comma Style format (also known as the thousands separator) in Excel 2010 often accompanies the Accounting number format. Like the Accounting format, the Comma format inserts commas in larger numbers to separate thousands, hundred thousands, millions, and . . . well, you get the idea. The Comma Style format also displays two decimal places and puts negative values in parentheses. What it doesn’t display is dollar signs. This makes it perfect for formatting tables where it’s obvious that you’re dealing with currency or for larger values that have nothing to do with money. Use the Comma Style format in a large table of financial data where you only want to display the currency symbols with the totals for the columns or rows. All remaining (detail) data can be formatted with the Comma Style, and the decimal points will line up with the totals that use the Accounting format. The gap on the right between the last digit and the cell border accommodates the right parenthesis in negative values, ensuring that they, too, align precisely on the decimal point. On the Home tab, click the Number dialog box launcher. In the Category list, select Number. Select the Use 1000 Separator (,) check box. Click the Comma Style button (with the comma icon) in the Number group of the Home tab to quickly format selected cells with the thousands separator. Monthly sales figures after formatting their cells with the Comma Style number format.